under the horizon (sunset), 2017, is a site-specific audio-visual performance that explores the temporality of dynamic celestial bodies in relationship to the human eye. 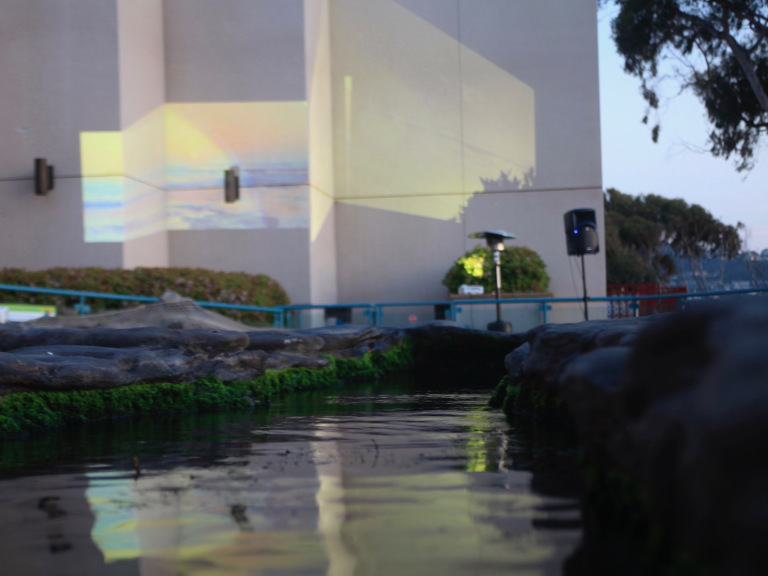 Sunset takes place at the Birch Aquarium’s Tide Pool Plaza during the hours of 6pm to 8pm, when the light is slowly shifting from day to night. An electronic wind-chime composition resonates from speakers situated in the terrace’s four corners, their sound emitting outward and towards the ocean. We observe the sun’s position disappear below the horizon at 7:14 pm, its apparent position an illusion of light created by atmospheric refraction. The sonic experience of wind chimes evokes this sensation of ephemeral light. The horizon-crossings of celestial bodies inform the compositions’ approach to time and timing. 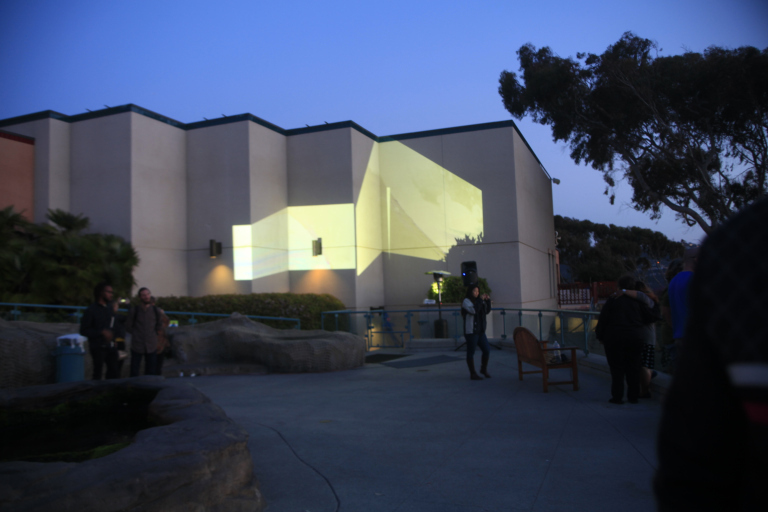 Once the sun dips below the ocean, video projections become the source of illumination for the space. Abstracted video of the Birch Aquarium’s infant moon jellies frame the plaza with two projections. The diaphanous anatomy of jellyfish and the arcing lines of its tank resemble planetary bodies and celestial orbits. 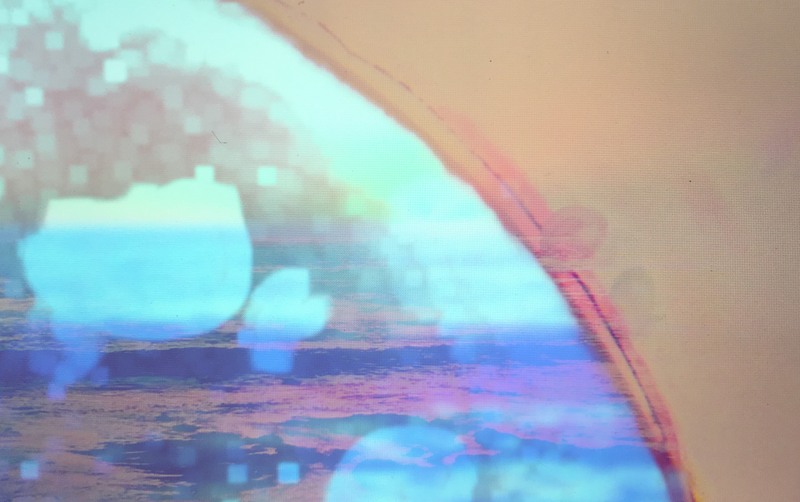 Similarly, the pastel hues of the digital video are reminiscent of atmospheric phenomena. White pillows are placed on the steps in between the two “touch” pools—creating a place for viewers to comfortably sit and observe their surroundings. Situated in front of these pillows is the main tide-pool and a white tent structure to its right. The collaborative conceptual framework of this piece stems from a discussion surrounding physics behind a sunset and the sun’s actual versus apparent position throughout its duration, the experience of watching a sun disappear beneath the ocean’s horizon versus a city or mountain-scape, and an enquiry into the binaries of marine space: aquariums, tide-pools, and the ocean. Some questions that arose in the process are: In light of anthropogenic climate change, what is the role of aquariums in species preservation? Will acidification cause the ocean to become a life-less pool? In this case, will aquariums be sole habitat for marine animals, analogous to the Svalbard Seed Vault in the Arctic?